What's better than pizza bagels? Mini Pizza Bagels! 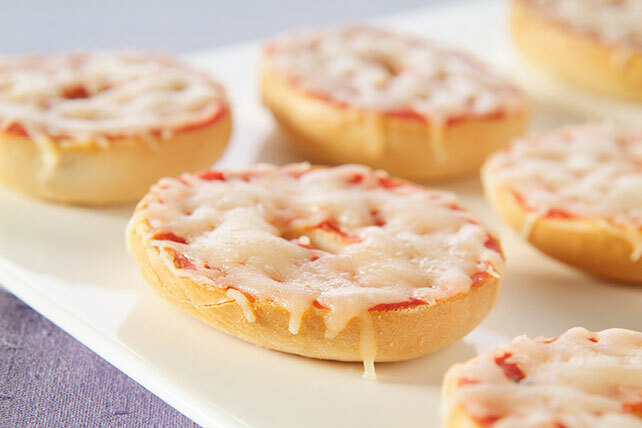 These delicious Mini Pizza Bagels are cheesy and saucy and make a great snack for after school. Spread cut sides of bagels with sauce; top with cheese. Broil, 6 inches from heat, 2 to 3 min. or until cheese is melted. After spreading bagels with pizza sauce, top with desired amounts of chopped green peppers and onions before sprinkling with cheese and broiling as directed.